Join the KMT Waterjet team---the global leader in waterjet cutting pump technology. Being a member of the team you are part of a unique group of people who not only love what they do, but love the technology we bring to a wide variety of businesses. Our team is comprised of talented individuals who have purpose, creativity and passion, and we are proud to be recognized leaders in the application of ultrahigh-pressure (UHP) Waterjet technology around the globe. We are committed to the professional growth and personal well-being of our team. KMT Waterjet Systems headquartered in Baxter Springs, Kansas, is a leading innovator and manufacturer of high pressure waterjet technology, with a global network of sales and service. KMT waterjets are sold worldwide with offices in over thirteen countries. Since 1971, they have served a pivotal role as true pioneers in the manufacturing industry by leading designs of waterjet intensifier pumps and precision cutting heads. 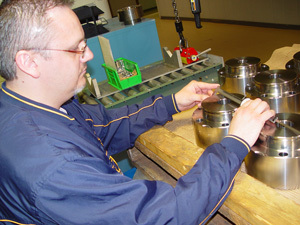 KMT Waterjet Systems is an Equal Opportunity Employer.